I found some copper wire as I was cleaning out my garage to prepare for my move and got sidetracked in making some little garden decorations! (Because crafting is WAY better than packing!) These would make great Father's Day Gifts for those fathers that like gardening! Best thing is: They are super easy to make! Both of these took me about 15 minutes total! You can get various diameters of copper wire by the foot at Lowe's or Home Depot. Find a diameter that is easy enough to bend, but not flimsy. Bend them into shapes and leave about 12" of straight wire at the bottom so you have something to stick into the ground. I find that it's easier to make the shape and then cut, instead of cutting a straight piece of wire and then bending it into the shape you want. If you're having trouble with shapes, try sketching a shape on a piece of paper and bending the wire into that shape. Don't forget about the moving sale! Just enter in the code: MOVE09 for 20% off of everything in the Schlosser Designs Store! What a wonderful idea! 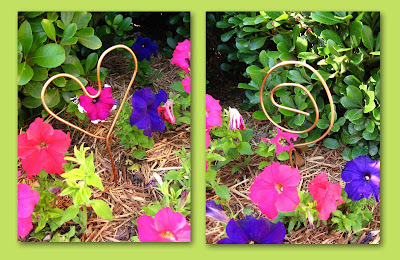 And I just happen to have a half roll of copper tubing sitting out in my flower garden right now. Seriously! It has been out there patina-ing since we started our bathroom remodel last... month? It will look much better as decoration than junk. Fun! Thanks for the idea! Aww, so cute and easy, I love this! I'll be linking. Hey these are perfect for those easter egg dipper picker upper thing you get from dying kit! I would have never thought about using them as decoration! I have tons of those since I buy the kits to dye yarn! You could also make tea-light holders using this idea, perfect for evening parties in the garden! These tricks really works to your...... dream home a new rejuvenated look. Thanks for providing such a nice information on garden decoration and home decoration products. I used this technique to give a new look to my garden and it really works.